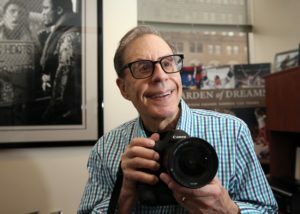 They adorn every wall, desk, table and shelf in the office of Madison Square Garden’s in-house photographer; dozens of pictures, some in color, some black and white. 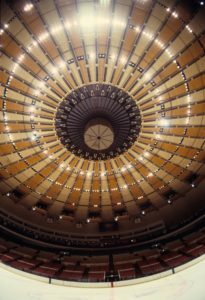 Woven together, they chronicle the last half century of a building that has managed to fulfill a claim worthy of a carnival barker: The World’s Most Famous Arena. Hired a couple of years before the current Garden opened in 1968, George Kalinsky has witnessed and then captured all of its many iconic moments. Ali and Frazier in The Fight of the Century. Willis Reed’s dramatic walk onto the court. The Rangers breaking The Curse. Frank Sinatra’s return. John Lennon’s last performance. The nominations of three presidents and visits from two popes. With the Garden’s 50th anniversary fast approaching, Kalinsky reflected on many of his favorite moments during a recent conversation in his office, surrounded by images that spurred a stream of stories. He spoke softly, but with passion, his eyes widening behind thick-framed glasses as he recalled going back and forth between the court and the locker room to check on whether an injured Reed would emerge from the locker room to play in the 1970 NBA Finals, and again as he relived the day that Sinatra showed up in his doorway, asking that he teach him everything he knew about photography, all in five minutes. Kalinsky uses a similar metaphor when he thinks back to his first two years at the Madison Square Garden Co., watching the new building rise from the ground, describing it as the eagerly anticipated birth of a baby. If the Garden is a “living, breathing thing,” as Kalinsky describes it, then his are its eyes. You needn’t look far to find its hands. Kalinsky’s association with MSG traces back to his beginnings as a photographer. While in Miami interviewing for a job as a newspaper cartoonist early in 1966, he spied the unmistakable figure of Muhammad Ali crossing the street to the 5th Street Gym, where he famously trained with Angelo Dundee. Hustling to follow Ali into his workout, Kalinsky was stopped by Dundee, who told him visitors had to pay a dollar. “I’m the photographer of Madison Square Garden,” Kalinsky quickly retorted, holding up the small 35 mm camera that he’d brought on the trip. Dundee raised an eyebrow. But he relented. Kalinsky shot Ali sparring, then took his film back to the Herald, which used one of the photos. When he returned home to Long Island, he brought the roll to the head of MSG’s boxing department, John Condon. Condon liked the work enough to hire Kalinsky to shoot Emile Griffith, the middleweight champ who regularly headlined the Garden. That led to an assignment shooting the Knicks, where he got a great image of Reed blocking a dunk. The Rangers hired him to shoot. Then the Garden hired him to shoot college basketball. After three months of paying him to photograph most every event in the building, MSG executives decided it might be more cost-effective to put Kalinsky on the payroll. “It just seemed a natural thing,” Kalinsky said. At the Garden, it was a time of transition. While its iconic name dated to an open-air arena leased to P.T. Barnum in 1879, MSG was in its 41st year at its third location, with construction underway on a fourth. The project had drawn the ire of the city’s first wave of preservationists, who opposed the demolition of Penn Station, a vast, classically columned building that would be leveled to make room for the new arena, built atop the rail lines. Even amid that political tumult, there was excitement about the new Garden. From the time he was hired, Kalinsky photographed progress at the construction site. Every so often, they’d take a headline entertainer or star athlete over to the site for promotional photos. The new MSG would open with a USO variety show hosted by Bob Hope and Bing Crosby. The night before, Kalinsky went to the building, eager to see what it looked like as the finishing touches were applied. He found more than 700 workers hustling everywhere, hammering and drilling and painting and stringing wire. Like most who have spent decades at the Garden, Kalinsky has favorite memories, and a unique perspective on many of them. The day that Pope John Paul II visited in 1979, Kalinsky was the only photographer allowed to be within close proximity. When the limousine ferrying the pope pulled up to the Garden, Kalinsky was waiting along with the company’s top brass. The first to emerge from the car was the archbishop of New York. He looked at Kalinsky and motioned for him to open the car’s rear door. After he did so, he extended a hand, which John Paul used for support as he climbed from the car. Kalinsky welcomed him to Madison Square Garden and they spoke briefly. “I’m talking to the pope and everybody is looking at me,” Kalinsky said. “[MSG Chairman Sonny] Werblin is looking at me. John Condon is looking at me. People from Gulf and Western [the conglomerate that then owned MSG and the teams]. Maybe there were seven or eight people total. As it turned out, Kalinsky’s prime location led to a photo seen around the world. As the pope went to the stage, he noticed a 6-year-old girl standing near the front. Motioning for a security guard to lift her over the railing, he took her and settled her atop the cart that carried him in. Kalinsky captured the shot at precisely the right moment, from the ideal angle, the light from flashbulbs going off across from him setting her face aglow. The photo is part of the Garden’s Defining Moments exhibit. In the days leading up to the historic Ali-Frazier fight in 1971, Kalinsky again found himself in rare air. He was in his office when he looked up to see Frank Sinatra in his doorway, introducing himself and extending a hand. “I hear you’re a great photographer,” said Sinatra, who famously had secured a ringside credential to shoot the fight for Life magazine. “I want you to teach me all you know about photography in five minutes. Several of Kalinsky’s photos from Ali-Frazier are among his better known. His shots from the fight are terrific. But the promotional images he captured leading up to it are indelible. Tired of the same old, square-off photos that promoters had used for years, Kalinsky set out to produce something more eye-catching. He got Ali and Frazier together at the Philadelphia gym where Frazier trained, a spot with which he was intimately familiar. There, he had them pose forehead-to-forehead, something not typically done at the time. 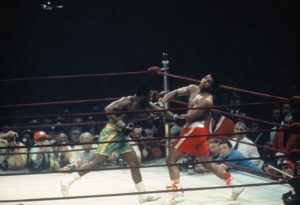 When they finished, he took them over to a large window, where he had Ali “ham it up,” clawing as if trying to get in while Frazier stood stoically next to a heavyweight champ training headquarters sign. While Kalinsky is most proud of the sessions he shot outside the ring, there is one from the fight that has become a favorite, largely because Frazier told him it was the one he liked best of any from his career.